The Head and Shoulders top stock pattern is probably the best known of all the reversal patterns. It often stands out sharply, and it's almost always possible to find one of them in the process of unfolding of some stock chart in a stock traders collection. 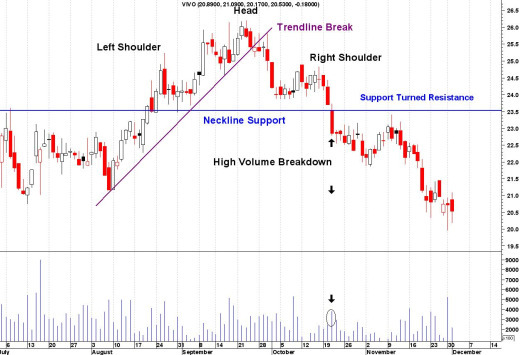 Head and Shoulders reversal pattern is made up of a left shoulder, a head, a right shoulder, and a neckline. Prior Trend: With any reversal pattern, there must be an existing up-trend to reverse. Left Shoulder: The left shoulder forms a peak that marks the high point of the current trend. After making this peak, a decline ensues to complete the formation of the shoulder. The low of the decline usually remains above the trend line, keeping the uptrend intact. Head: A second rally carries the stock higher than the first one, but is followed by a reaction that erases just about all the gain, leaving the price in the vicinity of the previous low. Right Shoulder: A third rally fails to reach the height of the Head before another reaction low sets in. The decline of the peak of the right shoulder should break the neckline. Volume should contract on the rise of this shoulder. If however the volume increases, beware of a false signal. Neckline: No Head-and-Shoulders should be regarded as complete until the price breaks down below a line drawn tangent with the lows of the left and right shoulder, or the neckline. The slope of the neckline will affect the pattern's degree of bearishness: a downward slope is more bearish than an upward slope. Sometimes more than one low point can be used to form the neckline. Neckline Break: The head and shoulders pattern is not complete and the uptrend is not reversed until neckline support is broken. Ideally, this should also occur in a convincing manner, with a high increase in volume. Price Target: After breaking neckline support, the projected price decline is found by measuring the distance from the neckline to the top of the head. This distance is then subtracted from the neckline to reach a price target. Any price target should serve as a rough guide. While it is preferable that the left and right shoulders be symmetrical, it is not an absolute requirement. They can be different widths as well as different heights. Identification of neckline support and volume confirmation on the break can be the most critical factors. The support break indicates a new willingness to sell at lower prices. Lower prices combined with an increase in volume indicate an increase in supply. The combination can be lethal, and sometimes, there is no second chance return to the support break. Return from "Head and Shoulders" to the Home Page: "Stock Market For Beginners"